The way forward is clear for natural gas-powered green mobility in Europe. Last Tuesday, a new EU directive came into force that calls for the expansion of an alternative filling station network throughout Europe. Member States are now required to set binding national targets by 2016. These include, among other things, the installation of natural gas and LNG fuel pumps, as well as transparent pricing at filling stations. With the ‘Directive on the deployment of an alternative fuels infrastructure’ [COM (2013) 17], the EU wants to reduce the transport sector’s dependence on oil and curb emissions. 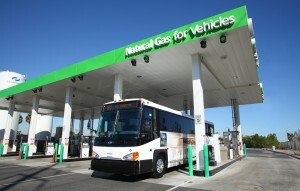 To this end, the directive focuses on particularly low-emission fuels, giving compressed natural gas (CNG) and liquefied natural gas (LNG) key roles to play alongside electric power. EU Member States are now required to establish a minimum infrastructure as well as develop a general strategy for providing better support and marketing of alternative fuels in the transport sector. These targets must be defined precisely and submitted by 2016. Furthermore, common standards must be set and clear pricing and fuel information made available to end consumers. Heavy load transport in particular stands to benefit the most from a switch from diesel to LNG, with its sophisticated technology easily rivalling that of established diesel engines. According to the EU directive, a network of LNG filling stations should be in place along major European transport routes by 2025, making the transport of freight using LNG technology a reality. The EU has proposed a recommended maximum distance of 400 kilometres between LNG filling stations to meet this goal. The infrastructure for CNG should also be expanded by 2025, with a recommended distance of 150 kilometres between stations. This should ensure the complete coverage and availability of natural gas and biomethane as fuels throughout Europe.